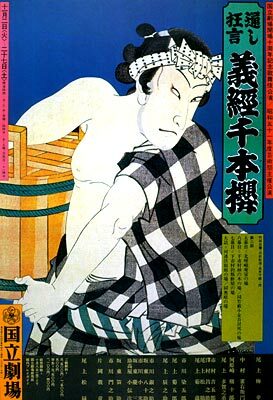 The play "Yoshitsune Senbon Zakura" was originally written for the puppet theater (Bunraku) and staged for the first time in the 11th lunar month of 1747 in Ôsaka at the Takemotoza. 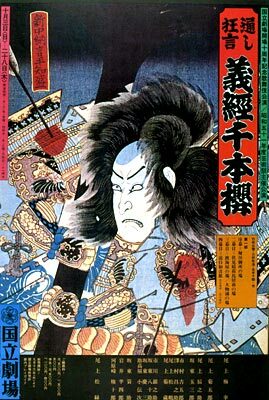 It was adapted for Kabuki the following year and staged for the first time in the 1st lunar month of 1748 in Ise with Kataoka Nizaemon IV (Tokaiya Ginpei, Yokawa no Zenji Kakuhan) and Yamamoto Koheiji (Tadanobu). It was performed for the first time in a city licensed theater in the 5th lunar month of 1748, in Edo at the Nakamuraza [casting]. "Yoshitsune Senbon Zakura" was performed for the first time in Ôsaka, at the Naka no Shibai, in the 8th lunar month of 1748 [casting]. I-1, I-2 and I-4 are rarely performed. I-3 is occasionally used to open a tôshi kyôgen performance. IV-3 is occasionally used to close a tôshi kyôgen performance. V-1 is sometimes performed by Ichikawa Ennosuke's troupe. --> A dedicated summary: "Ôuchi"
Yoshitsune has long desired the precious Hatsune drum and the retired Emperor bestows it on him, but it is really a plot by the imperial court to create discord between Yoshitsune and his brother Yoritomo, the Shôgun. --> A dedicated summary: "Kitasaga"
Wakaba-no-Naishi, the wife of the Heike leader Taira no Koremori, lives in humble refuge outside the capital. She learns that her husband is alive and sets out to find him with her son and accompanied by her retainer Kokingo. --> Dedicated summaries: "Kawagoe Jôshi" and "Heisoto"
The play opens with Yoshitsune waiting for a chance to meet his brother, the military leader Yoritomo, and convince him of his loyalty. Yoritomo's envoy questions why Yoshitsune accepted a gift of a tsuzumi drum from the retired emperor-the implied message of the gift being "strike the drum, strike Yoritomo." Yoshitsune says he accepted it in politeness but has never used it. And then there is the question of Yoshitsune's wife, who is the daughter of an enemy Heike general. Overhearing this, Yoshitsune's wife stabs herself to prove her husband's innocence, but her death is in vain, for within minutes one of Yoshitsune's impetuous warriors, Benkei, has attacked some of Yoritomo's men and thus ruined any chance of a reconciliation between the brothers. --> A dedicated summary: "Torii Mae"
Yoshitsune and some of his followers have fled to Inari Shrine in Fushimi. Yoshitsune's beautiful mistress, Shizuka, arrives pleading to accompany them, but Yoshitsune refuses. To console her, he gives her the tsuzumi drum, and tells her to think of it as part of himself. To stop her from following them, his soldiers tie her to a tree. After they leave, an enemy underling spies her and the drum. She is unable to escape, but Tadanobu, one of Yoshitsune's trusted men appears at a fortuitous moment and rescues her. All this has been observed by Yoshitsune on his way back from worshiping at the shrine, and in gratitude he gives Tadanobu the name Genkurô and entrusts Shizuka's safety into his hands. At this point no one is aware that this Tadanobu is not the real one, but a fox that has disguised itself as Tadanobu in order to be close to the drum, which is made from the skins of its parents. Only the audience has an inking of this as Tadanobu makes a solo exit down the hanamichi using steps called kitsune roppô-hopping three or four steps on each foot, and curling his fingers under to resemble paws. --> Dedicated summaries: "Tokaiya", "Funayagura" and "Daimotsu no Ura"
The first two scenes are set at the Tokaiya, a house which runs the boats that cross Daimotsu Bay. Tomomori, a Heike warrior who is believed to be dead, is passing himself off as the proprietor. In fact, he is waiting for the chance to avenge himself against the Genji by killing off their general, Yoshitsune, who is staying at the house. Yoshitsune never lets on that he has seen through Tomomori's disguise, and leaves. Tomomori intends to attack Yoshitsune at sea, but the latter is prepared and eludes the attack. Instead Tomomori's ships are sunk and in the third dramatic scene, a defeated Tomomori staggers onto the rocky beachhead. Yoshitsune appears and indicates that Tomomori's life will be spared if he enters the priesthood. But the great warrior no longer wishes to live. After an emotional speech, he climbs to the highest reef and ties an anchor rope about his waist. Raising the anchor above his head, he throws it into the sea. As the great coil of rope disappears over the edge; he gives a final downward glance, and is pulled backwards off the peak into the waves. This is the most dangerous scene in the play to perform as the actor has to throw himself backwards into the air (but not so far that he hits the backdrop), and hope that a mattress has been properly positioned to cushion his fall! --> Dedicated summaries: "Ko-no-Mi" and "Kokingo Uchijini"
Wakaba-no-Naishi, the wife of the Heike survivor Taira no Koremochi, travels with her young son and their retainer Kokingo, searching for her husband. While resting in the lower village of Ichimura, they are met by Gonta, a local bully who skillfully cons them out of their money. Later they are attacked by Genji forces, and in a spectacular fight, Kokingo sacrifices himself to save his mistress and her son. Gonta's father Yazaemon finds Kokingo's body and decides to take the young warrior's head back home. --> A dedicated summary: "Sushiya"
This is the most famous scene of the whole play and takes place in Yazaemon's sushi shop. Yazaemon has been harboring the Heike lord, Koremori, at the shop and is passing him off as an assistant. He has given Koremori permission to marry his young daughter, Osato, who is besotted with him. But as Osato is flirting with Koremori, Gonta arrives with the intention of squeezing some more cash out of his mother to cover his gambling debts. He has been banned from the house by his father, but he knows his mother is a soft touch. This scene is hilarious as Gonta pretends to be in dire straits and cries crocodile tears to weaken his mother's resolve not to give him any more money. While she is not looking he dabs tea on his face to wet it and then shows his mother his 'tears.' She finally gives in and says she will give him the money that she was planning to leave him when she died. When she tries to open the safe she finds Gonta's father has locked it, but Gonta conveniently picks the lock for her and she hands over 30 ryô. Just as he is about to make off with it he spots his father returning in the distance and knows there will be hell to pay if he's caught in the house with the money, so he hides it in one of the big empty sushi rice tubs and makes a quick exit. Yazaemon returns to the shop with a bundle which turns out to be Kokingo's decapitated head. He quickly hides it unobserved in another of the empty sushi tubs, and then talks privately with Koremori, advising him to move the following day as the authorities suspect he is hiding there and have demanded that Yazaemon produce his head. He then gives his blessing to Koremori's wedding of his daughter that night and leaves them alone. Koremori, however, seems not to be in the mood, so Osato retires alone. Koremori cannot bring himself to join her in bed and instead confesses to her sleeping form he is already married with a child. A short time later Koremori's wife and child arrive at the door by chance looking for somewhere to spend the night, and Koremori lets them in. Soon after messengers arrive warning that their house is to be searched by the official Kajiwara Kagetoki and Osato sadly but bravely sends the family off. Unfortunately all this has been overheard by Gonta who says that he will pursue Koremori and hand him over for the reward money. As he takes off he grabs the nearest sushi tub and disappears down the hanamichi. Of course, we all know that he has taken the wrong tub-the one containing Kokingo's head. Kajiwara arrives but when Yazaemon opens his tub to show him 'Koremori's head' he finds it contains money. Gonta reappears leading a woman and child bound and gagged. He states they are Koremori's wife and child. He also presents Kajiwara with a severed head, saying it is Koremori's. Kajiwara inspects it and confirms the identity. At this point the audience is horrified that Gonta can sink so low and despises the fact that he has done all this for money. Kajiwara is pleased with the outcome and leaves, but not before presenting Gonta with a valuable kimono belonging to the emperor Yoritomo which he can sell for a great price. No sooner has Kajiwara left than Yazaemon in a rage stabs Gonta. In his poignant death speech we find out that his treacherous behavior was all a disguise to win him back into his father's favor. The woman and child he had handed over were not Koremori's wife and child but his own, and the head was the one he found in the tub, which he had shaved so that the hairstyle matched Koremori's. The lord and his family reappear alive and well and find a hidden message inside the kimono Gonta was given which indicates Koremori's life will be spared if becomes a priest. Gonta is finally reconciled to his family as he dies in his mother's arms. --> A dedicated summary: "Yoshinoyama"
Shizuka and Tadanobu are on their way to Yoshino to look for Yoshitsune. They muse about which carries the greater weight--love or duty. To lighten their mood they dance and recall tales of valiant battle, while looking at the precious drum. As they depart, Tadanobu follows Shizuka, and as he starts down the hanamichi, his appearance changes. Using a costume technique called bukkaeri, in which threads are pulled out and the outer costume is pulled down to reveal another inside, Tadanobu becomes more fox-like in a white costume decorated with gold foxfires. He leaps high in the air several times and then skips down the hanamichi. --> A dedicated summary: "Shi-no-Kiri"
Yoshitsune has reached Yoshino and welcomes his retainer Tadanobu, but becomes suspicious when Tadanobu says he knows nothing of the whereabouts of Shizuka or the drum. Soon Shizuka arrives safely but agrees that there is something different about this Tadanobu (who is the real one). She recalls that the one she traveled with kept appearing and disappearing at odd moments, but would always return if she struck the drum. Tadanobu is ordered to be held captive until the mystery is solved. To test which Tadanobu is real, Shizuka strikes the drum and the other Tadanobu suddenly appears. He soon admits contritely that he is an imposter and reveals himself in his true fox form. He explains that he followed the drum as a way of fulfilling his filial duties, but he realizes that by causing the real Tadanobu and others trouble he has brought shame on his parents and will leave. Yoshitsune overhears his pitiful story and presents the grieving fox with the drum. Filled with joy the fox plays with the drum and hears his parents warn him of a coming attack on the mansion. He uses his magic to rout the enemy and then flies away with the drum . --> A dedicated summary: "Okuniwa"
The Heike warrior Noritsune, who is disguised as a priest, tries to attack the Kawatsura mansion. He has to face a pack of foxes, which he finally succeeds in chasing away. Then, he is suddenly challenged by Yoshitsune's followers, headed by the monk warrior Benkei. Noritsune is easily captured, but Yoshitsune orders his release on one condition: Tadanobu will challenge the Heike warrior later to a duel to avenge the death of Tadanobu's brother Tsugunobu, who was killed by Noritsune at the battle of Yashima. --> A dedicated summary: "Zaôdô"
Tadanobu awaits the arrival of Noritsune in front of the Zaôdô Temple in the Yoshino mountains, under the blossoming cherry trees. Some priests, allies of Noritsune, attack Tadanobu, but he easily drives them off. Noritsune arrives and is easily beaten by Tadanobu who is aided by the magic powers of the fox. Just as Tadanobu is about to make the final thrust to finish Noritsune off, Yoshitsune arrives, accompanied by the child-emperor Antoku. Yoshitsune announces that he will pardon Noritsune if he will agree to take Antoku to his mother who has become a nun and resides in a nunnery at Ôhara, with the understanding that Antoku will also become a priest. Noritsune agrees and leaves for Ôhara with Antoku. Yoshitsune bids Lady Shizuka farewell and sets out to find a new hideout as it has become obvious that his brother Yoritomo has discovered that he has been in hiding at the Kawatsura Mansion. And Tadanobu leaves with lady Shizuka to accompany her back to her home in Yamato. V-1: Don Kenny in "Grand Kabuki Overseas Tours"
 When this scene is performed by Ichikawa Ennosuke's troupe, the fox's exit is done with an amazing chûnori from the stage to the third floor of the theater.